Things may seem a little quiet on the Frock Coats front, but I have been working away very hard lately, sorting out the pattern so that once have sourced the fabrics I am good to go. I’ve worked up a basic calico test (see left), essentially just to check the pattern works, but now I want to up my game prior to making it for real. I’m itching to get started making up the coat, but I’ve been caught out by enthusiasm before, and know that racing into cutting final cloth can be fatal, so to work it out of my system I’m gonna do something a little radical! Finding a superb supplier for my felt and woollen fabrics has been an absolute godsend, and their materials are of superb quality at competitive prices. My favourite fabric out of the whole coat is the purple felt, Fabric (2) in my Fabric Breakdown (see right). It has a wonderful a richness of colour and weight about it. 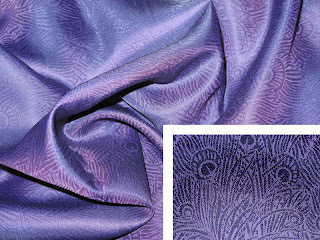 So, to properly test myself on construction techniques; to iron out any issues I might find with my pattern; and just for the hell of it make a version of the coat you CAN step out of the front door in, I am going to make one totally in this fabric, using a matching velvet to accent the design. By ignoring all the complications of the patchwork nature of the coat I can truly focus on how it is assembled. 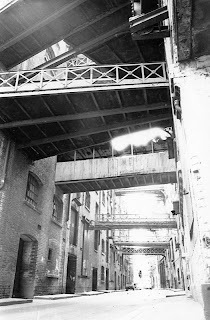 I can remember when I was at sixth form college on a photography course, we started out with black and white images as this makes you look at composition far more than pretty colours, making you a better photographer in the long-run. 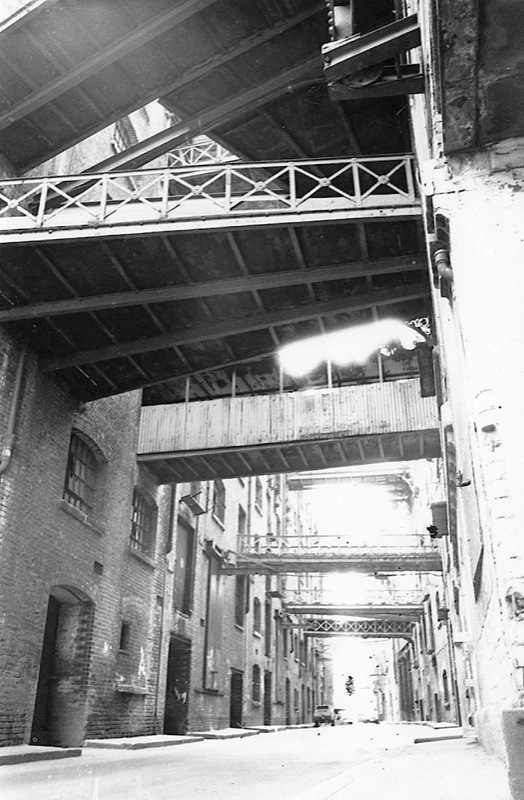 I regularly visited Butler’s Wharf (location for Resurrection Of The Daleks) near Tower Bridge, and used it as the focus of many projects. I am going to apply the same principles to this coat! The screen-accurate coat I plan to make won’t exactly be practical. It’s not really the sorta thing you step out of the house wearing in the morning, or a coat you throw on to pop out and get a loaf of bread! What I plan to do is make a vastly more sober version, worked out of a single colour, with only the texture of fabrics to accent the design – though I still think I’d have to be brave to wear it in Tesco’s! 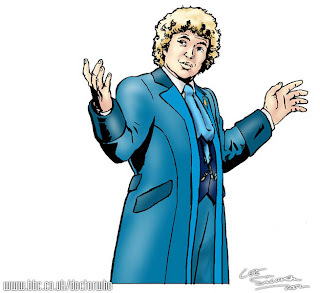 Now, there is a form of precedent to this, as The Doctor was drawn wearing a natty blue number for the online story, Real Time. I don’t really like the bright blue it was made from, and much prefer the purple I have in mind. Here is a visual of what I have in mind. 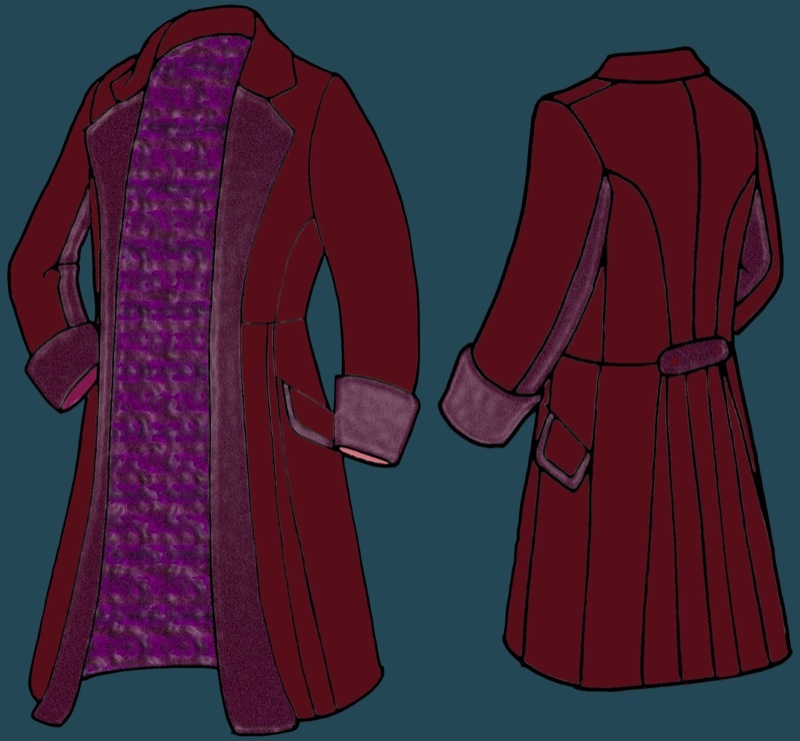 The body will be the purple felt; the lapels, cuff, back strap and pocket flap trim will be velvet; and the lining is some form of patterned matching fabric. I have already bought a few metres of the purple felt (see right), which arrived a couple of weeks back, having been dyed specially to match the specifications I asked for. Freed of the constraints of 100% screen-accuray, I can now have some fun and indulge myself in sourcing the rest of what I need. Firstly I am going to find a matching velvet. 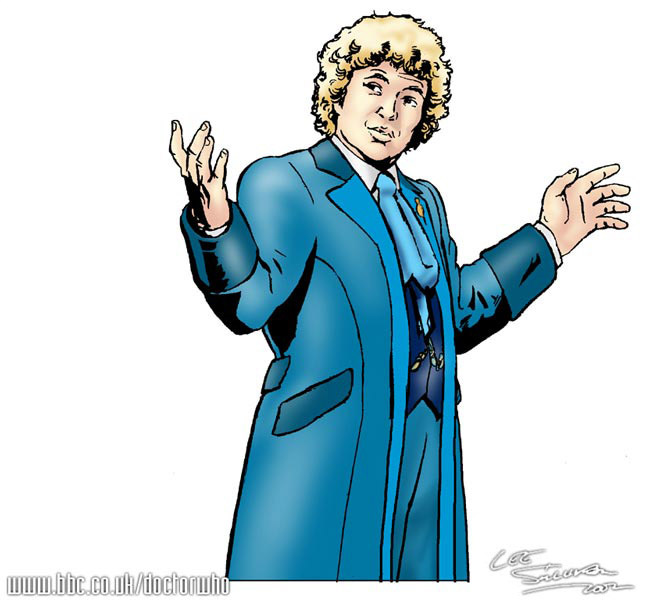 The obvious thing to do would be the collar (as is conventionally on quality gentlemen’s coats), but since one of the lapels of the final coat will need to be in velvet, I want to get some experience working with it, as it can be notoriously difficult. I'll make both lapels of this coat, plus the cuffs and maybe another panel or two in velvet, but I don't want to over egg it. Hidden inside the coat is my only chance to make a statement. I can't just use a plain colour lining, can I? It just so happens I have seen the perfect lining which I spotted it while on a fabric hunt a few months back. I thought it was a great little find and logged it for future reference, and now I have the perfect opportunity and excuse to buy it and use it. As you can see, it's not as complex as the real lining (few linings are!) but it has a subtle, extrovert quality about it, with the peacock feathers that catch the light as it moves. So, first up I need to get everything cut. This time around it's all very straight forward, since I do not need to worry too much about which panels are cut from what fabric, but I quickly realise that a couple of the panels are very similar in size and shape, and could easily be reversed, so labelling each carefully will be important. Below you can see the back and side panels (below, top left); the bulk of the skirt (below, bottom left); and the front panels (below, right). With everything cut, I need to do a bit of tailoring preparation to the front panels similar to the work I did under iPad Stitching over on my Tennant Suit Blog. 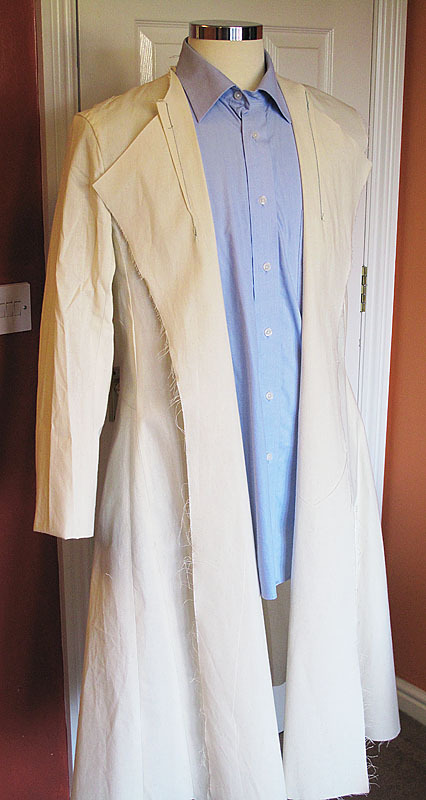 From the pattern piece (see above, left) I cut the body of the coat (see above, centre); and a panel of interfacing from horsehair, attaching linen tape along the roll line of the lapel (see above, right). This gives support to the fronts and defines the roll line of the long lapels. The lapels are then pad-stithced (see right) for their entire height, which helps shape them and keep them from pealing back. It’s a bit time consuming, but once done it is done - there is no messing around later trying to get the lapels to fold right, so saves time in the long run. Making up is pretty straight forward, so I wont go into it too much here. The outer pockets are a little involved, and for the purposes of this coat I have had a little fun binding the edge of the flap with the velvet (see left), though the real coat will be piped with the green binding. 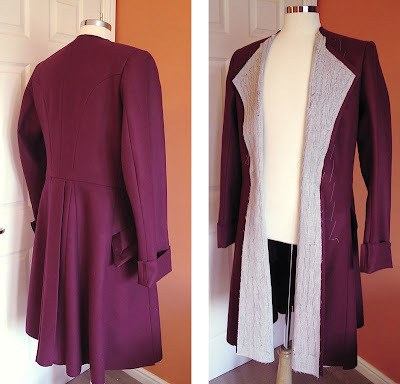 It’s not long before the body of the coat is together, and the sleeves are on. Looking good. 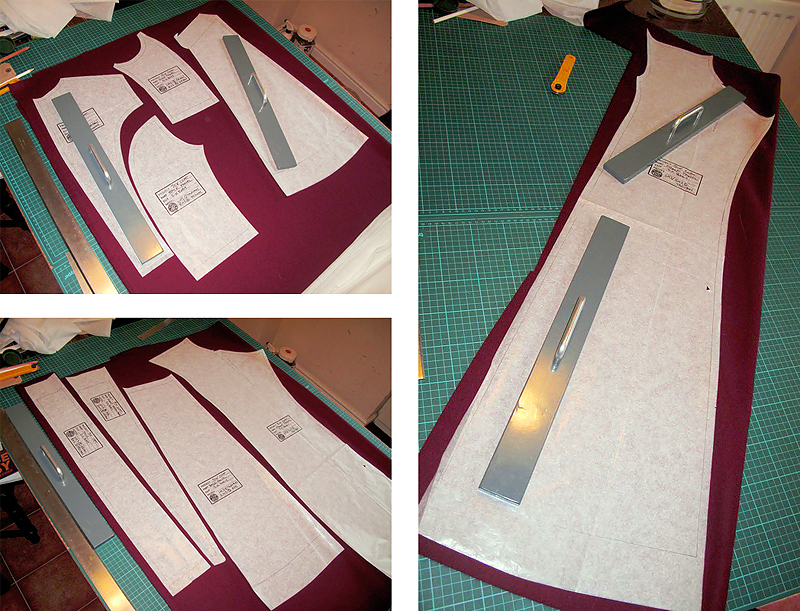 I then need to cut the lining, which for this coat differs more then most from the pattern for the body. That said there are sparse internal pockets, and those are patch-pocket style, so no complicated welts. Never one to make my own job easy, for the purposes of this being a practical wearing coat, I have added a welted pocket inside both sides. I’m gonna take a quick break from making it up for now, just to check things over before installing the lining and attaching the collar and cuffs. They way things are going, it won’t be too long, so do check back soon to see the finished coat. You know, I had a similar thought about the Sixth coat style with it unique long lapels - that it could look really nice in one colour. This is really excellent work. That purple's really quite beautiful. I love the color, but my favorite thing in the post has to be the lining. I adore it. I'm wanting to make this for my friend's son. Where did you get the pattern or did you make it yourself? Where did you find that shade of purple felt and lining and velvet? 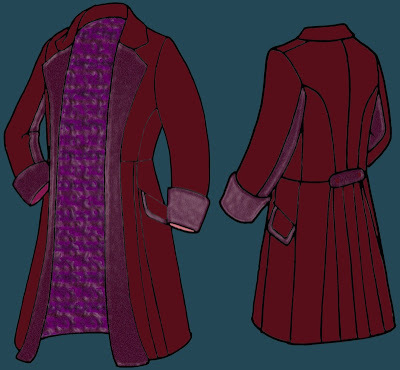 The purple fabric was custom dyed for use in the main Colin Baker coat - the other fabrics were sourced in soho, though now long gone.